Chiral Technologies is the global market leader in enantioselective chromatography and offers the most extensive portfolio of chiral stationary phases (CSPs) manufactured by Daicel Corporation. 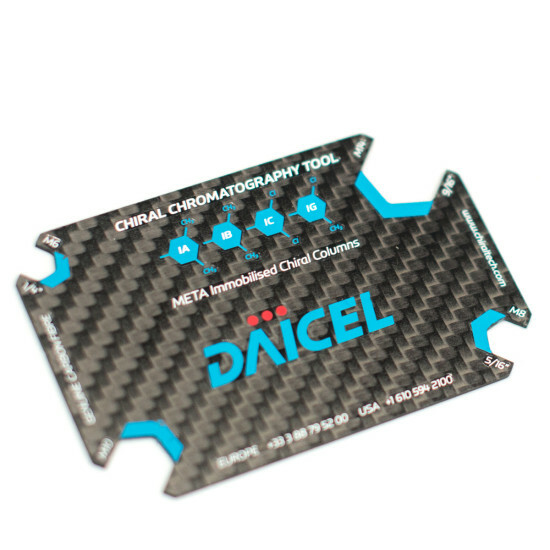 We designed and produced a carbon fibre tool to be used on a day to day basis as a business card and a functional HPLC spanner. Chiral Technologies is the global market leader in chromatography laboratory equipment, with a focus on HPLC columns. After years of gifting the usual branded merchandise it was time for something different so the client turned to us. Could we produce something memorable, useful and above all relevant to the scientific community they represent? It’s a tricky one; their customers are highly skilled, no-nonsense laboratory technicians at the cutting edge of chromatography. Working closely with the client, we set about creating a cool credit card sized gadget that technicians would be excited to use every day. Identifying a daily problem encountered in the lab was our starting point. 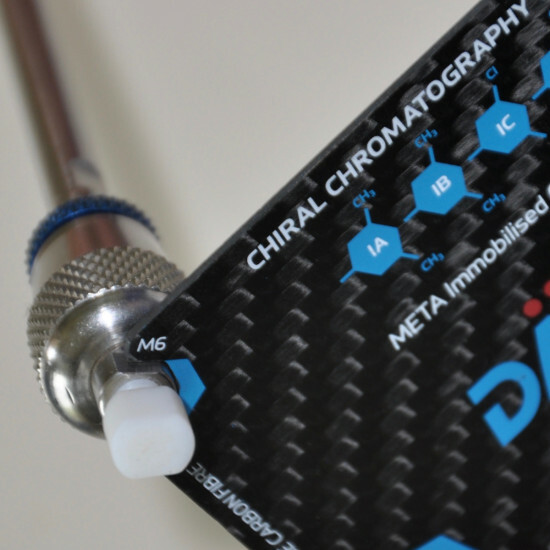 Chromatography machines require test rods to be swapped in and out regularly so we developed a dedicated credit card sized spanner machined from carbon fibre. This is branded merchandise with attitude! HPLC rods require careful handling and only need to be fixed finger tight. We proposed putting the most commonly used spanner sizes in all four corners of the tool, giving it a distinctive look and leaving the central area of the tool clear for branding. We produced 2,000 units for Chiral who used the tools as business cards at major trade shows in both the USA and here in Europe. You have to hand it to this product – not many pieces of promotional merchandise are this cool!